Soak up the rich history of New Orleans on this walking tour. Experience paranormal activity such as cold spots, apparitions and the possibility of catching an orb. Visit locations with your knowledgeable guide. Learn about traditional burial practices, Voodoo, vampires, and ghosts. Hear stories of intrigue and see interesting architecture. A real EMF Meter - Ghost/Paranormal Detector will be used during this tour. To add to the fun and entertainment of this tour guests will be allowed to stop in bars along the tour route and purchase a to go drink before the group heads out to the next location. Please keep in mind that some bars allow children inside however some do not. Welcome to the home of the drunken tours .... where learning is intoxicating. This tour takes place in the French Quarter, where you'll meet your guide. From there, you will explore Louisiana's complex culture and rich history, and experience that magical mystery that makes New Orleans city so irresistible. During this tour you will notice the beautiful architecture throughout the French Quarter that makes it so unique. You will see where Hollywood stars have decided to call the French Quarter home. Do you know what pirates, prostitutes, convicted felons all have in common with with the founding of New Orleans? Or why locals walk down to Jackson Square when it rains? Come find out on this history-packed tour of the French Quarter. 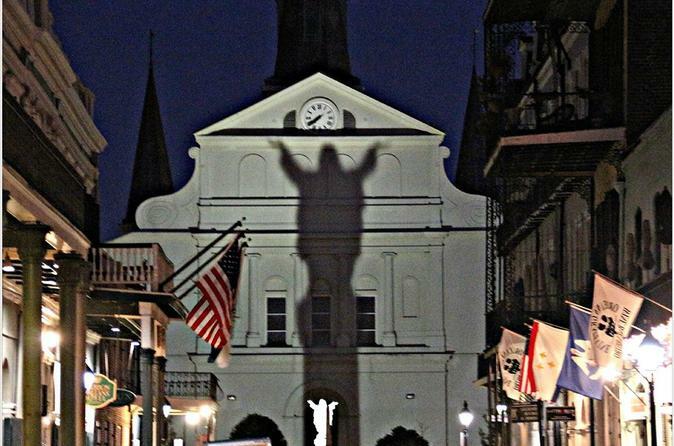 Have you ever wondered why New Orleans is considered the most haunted city in America? In this tour you'll be exploring the 'dark side' of New Orleans history, too. Visit multiple locations of unsolved murders and suicides. Hear stories of real documented reports of vampires and ghosts roaming around the streets of the French Quarter. Visit locations where vampires held their victims and fed off of them. Learn about New Orleans' traditional burial practices and how they are different than most. This will explain why the city has an above-ground cemetery, along with how and why it recycles the same vaults over and over again. On this tour you will also visit locations where scenes from unforgettable movies have been filmed. Stop at many of the attractions and National Historic Landmarks that this city has to offer along the way, some of which are the St. Louis Cathedral, St. Anthony's Garden, The Cabildo, The Presbytere, The Ursuline Convent and Jackson Square. Before this tour concludes you will visit the most poplular locations throughout the world-famous French Quarter. To add to the fun and entertainment of this tour guests will be allowed to stop in bars along the tour route and purchase a to go drink before the group heads out to the next location. Please keep in mind that some bars allow children inside however some do not. We make learning intoxicating!